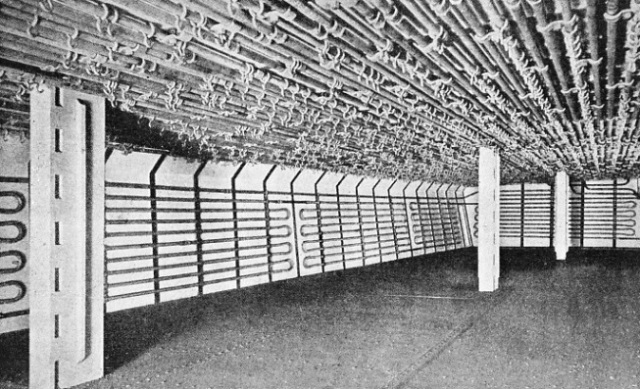 TWENTY-NINE CARGO SPACES, insulated by granulated cork, are installed in the Imperial Star, a Blue Star liner equipped with refrigerated machinery for the carriage of meat. The spaces have a total capacity of 528,419 cubic feet. The Imperial Star, a vessel of 10,670 tons gross, was built in Belfast in 1935. She has a length of 516¾ feet, a breadth of 70 feet and a depth of 32 feet. DURING the last fifty years the refrigerated ship has changed conditions of life for millions of people, especially those who live in crowded industrial countries such as the British Isles, in primarily agricultural and farming countries overseas such as Australia, New Zealand, South Africa and the Argentine, and in many tropical countries. Thanks to the steam and motor ship, to the research scientist and the engineer, our transport of perishable foodstuffs, particularly meat and fruit, has made immense strides in recent years. the port of Rome. To this day dried or cured fish is consumed in large quantities by Latin peoples, and Newfoundland schooners still trade across the Atlantic and down the American seaboard to the West Indies and Latin America; but the science of carrying fresh meat and fruit across the sea made little progress from ancient times to the ‘seventies of the last century, when the clippers raced home from China with tea. Pickling in brine was the chief method of preserving food on land and at sea. Those who made long voyages gave up hope of dainty meals as soon as the coast dropped below the horizon. Live chickens, and often a cow, were carried to alleviate the hardships of ocean travel, and on special voyages animals and seeds were taken by sailing ships to newly discovered lands to propagate the herds and crops that now flourish. It was not possible in those days to transport thousands of tons of meat and fruit in prime condition from one side of the world to the other. The problem of preserving food, however, did much to help the development of shipping. Spices were needed to preserve meat and to disguise the taste of food that was no longer fresh. The spices carried to Europe by the early merchant adventurers fetched high prices. When South America, Australia and New Zealand began to develop as cattle- and sheep-raising countries, meat was at first merely a by-product. There was too much of it to be consumed locally. In contrast to the hides and wool of the animals, meat could not be preserved during the voyage through the tropics to the meat-eating countries. Similarly many fruits rotted in orchards overseas because they could not be brought to market in industrial countries. These countries were limited to the consumption of local fruits and of oranges or similar fruits that could survive a short sea voyage. Thus, except when there was a glut, fruit was a luxury beyond the means of poor people, and the possibility of being able to eat fresh fruit all the year round seemed fantastic and against the laws of Nature. People would have laughed at the idea of buying for a penny an apple that had been brought 12,000 miles to market. If it were not for the work of the food ships the inhabitants of Great Britain would starve. Grain and beverages such as tea, coffee and cocoa do not require refrigeration or the newer methods of gas-storage, but every year the importance of the refrigerated ship increases. More than half the beef and mutton eaten in Great Britain is imported, as well as 90 per cent of the butter and 75 per cent of the apples. Bananas and citrus fruits imported from distant countries would never reach Great Britain but for the refrigerated vessel. The ship is the main link in the system of scientific storage that begins at the overseas port and ends in British shops. Food preservation with natural ice has been known for centuries. Ice was imported into Great Britain in large quantities during Queen Victoria’s reign and up to 1914, when war compelled the British to rely upon refrigeration plants. Natural ice was tried as a food preservative in sailing ships, but it was not successful because the ice thawed too quickly. The rapid growth of the population and the continued scarcity of meat became a serious problem in the middle of the last century. Salted beef and pork and canned beef and mutton were imported and cattle were shipped alive from America. It was impossible to ship live cattle from the Antipodes because the distance was so great and consequently the freight charges were high. 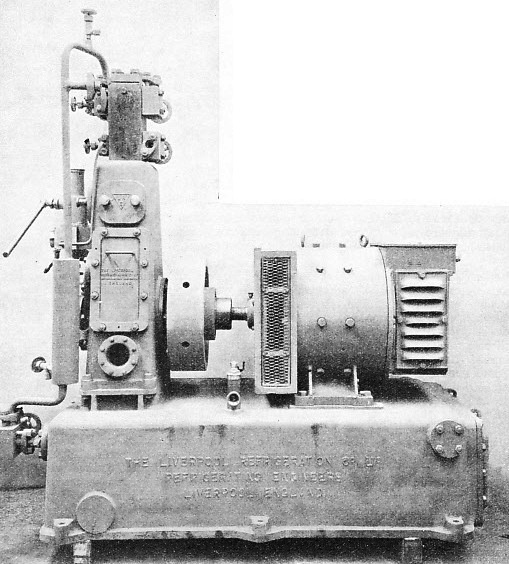 ELECTRICALLY DRIVEN VERTICAL COMPRESSOR of the type often used in refrigerated ships. This type has the advantage of compactness as the condenser is incorporated in the bedplate. Carbon dioxide (CO2) gas is used as the refrigerant, and brine circulated through pipes in the holds produces the right degree of temperature. There were many set-backs before meat was transported satisfactorily. Among the pioneers was Thomas Sutcliffe Mort, who had emigrated from Bolton (Lancs.) to Sydney, New South Wales. One morning, it is said, he read in a newspaper that a prehistoric animal had been found perfectly preserved in a glacier. He exclaimed, “I have discovered the secret of how Australia’s abundance may supply Europe’s need.” In 1861 he established at Darling Harbour, Sydney, what is claimed to have been the first freezing plant in the world. A plant was installed in a sailing ship in 1876, but to Mort’s disappointment it was a failure. The first successful shipment of meat under chemical refrigeration was carried by the S.S. Paraguay from Buenos Aires to Rouen in 1877. The news was telegraphed to Australia, and Queensland farmers instituted an inquiry. Then the S.S. Strathleven was fitted with refrigerating machinery and insulation. Meanwhile, in 1879, the Anchor liner Circassia, equipped with a cold storage machine, had successfully carried chilled meat from America to Europe. The Strathleven sailed from Sydney, called at Melbourne, and reached London on February 2, 1880, with the first shipment of frozen meat from Australia. The cargo was small but its importance was realized in Great Britain and Australia. About 40 tons of beef and mutton costing from 1½d to 2d a pound in Australia fetched, at Smithfield Market, London, from 4½d to 5½d a pound for the beef and from 5½d to 6d a pound for the mutton. Queen Victoria and the Prince of Wales (afterwards King Edward VII) accepted joints from this consignment. This was regarded as the beginning of the frozen meat trade. At the end of 1880 a consignment of more than 4,500 sheep and lamb carcasses and 100 tons of butter reached London in the Protos at a time when London’s supplies were failing because of severe snowstorms. Then the Europa was fitted out for the new business, and in 1881 the Orient Line took up the trade. Its steamships Cuzco, Orient and Garonne brought large consignments from Australia. New Zealand began her trade in 1882 by sending frozen sheep in the Shaw, Savill and Albion sailing vessel Dunedin. She took ninety-eight days on the passage, but landed the meat in good condition. The New Zealanders were offering a substantial subsidy for a direct service of refrigerated steamships to British ports; but in the ‘eighties some steamship owners were chary of the new system, as it entailed considerable alterations to the vessels and for some time frozen mutton was carried under sail. At first there were good reasons for the shipowners’ hesitation. Of the 17,000 sheep sent from Australia in 1881 rather fewer than one-third arrived in prime condition. About half the remainder were unsatisfactory and the rest were useless. The pioneers of the industry soon remedied that deficiency. Their enterprise built up a vast trade and put Australian and New Zealand frozen mutton and lamb and a variety of other produce on the dining tables of millions of British homes. For a long time beef from Australasia was unsatisfactory until low-temperature research made new methods of preservation possible. Scientists found that the size of the carcass of the bullock, compared with that of the sheep, delayed the freezing process. When freezing is rapid, small ice crystals are formed and the meat juices are sealed in the cells; when freezing is slow, larger crystals crush the cells. In the process of thawing, the broken cells are unable to absorb the lost juices, which drip from the carcass of the bullock. By cutting up the carcass into joints and thus reducing the size of the unit much quicker freezing is obtained. The refrigerating plant of the early days, operated from the main boilers, reduced the ship’s speed and sent up coal consumption by an appreciable amount. This made a corresponding addition to the coal bill, especially if the vessel were bound home via the warm Indian Ocean and Suez Canal route. If she went round Cape Horn (the Panama Canal was not built) and spent more time in cooler waters, she did not need to run her refrigerating plant for so long. Frozen meat requires to be kept at 12° to 15° Fahrenheit, chilled meat at 29°, with no more than a ½° degree variation on either side of the nominated temperature. Fruit requires various temperatures, pears being carried at about 29°, apples at 32° to 33°, oranges at 35° to 45° and bananas at 54°. Fruit is generally carried in chambers fitted with forced air circulation, and frozen and chilled meats in chambers cooled by pipe grids on the walls and overhead. A refrigerated ship generally carries engineers who have nothing to do with the operation of the vessel, but who are concerned solely with the condition of the perishable cargo of food. Should a vessel meet with a mishap, one of the first things the underwriters ascertain is whether her refrigerating plant is working. If the storage plant is not functioning, the cargo, worth thousands of pounds, will be ruined. The temperature of a hospital patient on the danger list is not more carefully charted than the temperature of the refrigerated cargo of a ship. Time is vital, particularly with fruit, and modern fruit carriers are much faster than general cargo ships. Liners on the Australian route carry meat cargoes. So rapidly does meat decompose in the tropics that, were it economically possible to transport unrefrigerated fresh meat from Australia to Great Britain by air, the meat would decompose on the flight through the torrid zone. Refrigeration is the only possible method. The weight of the plant at the time of writing rules out the possibility of air transport. DUPLICATE PLANT is installed in the Blue Star liner Almeda Star. Either set of machinery is capable of maintaining the necessary temperatures throughout the ship. Either of the refrigerating machines consists of a tandem compound steam engine driving from its tail rod a CO2 gas compressor, having a cylinder diameter of 7½-in and running at a normal speed of seventy revolutions a minute. The photograph shows the ends of the two gas compressors. The transport of fruit presents more difficulties than the transport of meat. Even to-day there are many luscious tropical fruits which cannot be shipped for any distance. There are limitations to the plan of plucking unripened fruit and shipping it so that it reaches market before it has time to rot. Only within recent years has the orange been obtainable all the year round, and the banana was a curiosity in Great Britain until the beginning of this century. Fleets of specially designed ships are devoted solely to the shipment of bananas. Hundreds of millions of bands (bunches) of bananas are shipped annually in specially built vessels from tropical America, the West Indies and the Canary Islands to the United Kingdom, the United States, and the Continent. The French have vessels to bring the fruit from their colonies in the West Indies and Africa, and the Germans have built ships for bringing bananas from German-owned plantations in the Cameroons. Bananas are cut, when they are green and hard, in hands of about a hundred bananas attached to the stalk. The whole operation of cutting and marketing the banana is carefully timed. Some companies have their own plantations in the tropics, their own fleet of refrigerated ships and their own marketing organization. The plantation manager is informed beforehand when a vessel is due, and arranges for the fruit to be cut and ready directly the ship arrives. Then the bananas are placed in the insulated and ventilated holds and are inspected at intervals during the voyage. Vessels built for the banana trade are equipped with refrigerating machinery and fans for circulating large volumes of air over brine-cooling batteries. Instead of deep holds the vessels have ’tween decked holds. Fresh air is admitted according to requirements, and as the ship approaches a discharge port where the temperature is low the air is' heated before the bananas are unloaded so that they do not suffer damage by frost. Speed is essential for these fruit carriers, and as many of them go direct to small ports in the tropics where big liners do not call, they have accommodation for about a dozen passengers. In recent years British and Continental shipyards have specialized in the construction of refrigerated fruit-carrying motor ships. An interesting vessel of this type is the Cap des Palmes (1,950 tons), built in 1935 for the Compagnie Marseillaise de Navigation a Vapeur (Cie. Fraissmet). A vessel of the two-decks type with ‘tween decks in the four holds, she is 330 feet long and has a speed of 17½knots. The refrigerating machinery consists of two ammonia machines and the holds are cooled by eight fans. This vessel runs between Marseilles and the French African colonies. A large number of fruit ships have been built recently in Great Britain. Such ships as the new Shaw Savill vessels, those for the Clan Line, the Commonwealth and Dominion Line, and the New Zealand Shipping Co. are fully equipped for the carriage of fruit and refrigerated produce. To-day the banana is an important article of food in Europe and North America, and the pioneering firm is the United Fruit Company, of Boston, U.S.A. Its British subsidiary firm is Elders and Fyffes, Ltd.
Fruit carriers do not rival in size the ships engaged in the meat and fruit trade with South America, such as the Blue Star motor liner, Tuscan Star, of 11,449 tons. She has seven large holds with forty-one insulated spaces, fitted for carrying meat and fruit. The meat trade from the River Plate was built up by the enterprise of shipping companies such as the Houlder Line, H. and W. Nelson, Ltd., Blue Star Line, and the Royal Mail Steam Packet Company. There are similar examples on other routes. The successful carriage of meat and certain fruits has caused an economic revolution, but much remains to be discovered. Every step forward means the opening of new markets for the producer, and the introduction of a wider variety of food to the consumer. 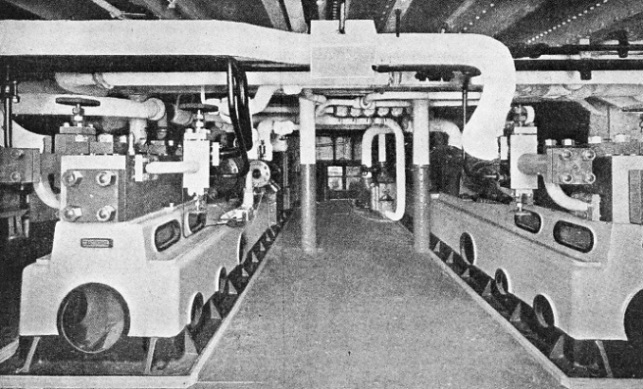 BRINE PIPES AND MEAT RAILS in one of the ’tween deck chambers of the Blue Star liner Almeda Star. This vessel has no fewer than forty-nine insulated cargo chambers. Provision is made for the circulation of brine at four different temperatures - “freezing brine” for chambers loaded with frozen goods; “chilling brine”, for chambers loaded with chilled meat and other goods; “auxiliary chilling brine”, at any desired higher temperature; and “thawing brine”, for thawing the chambers after the cargo has been discharged. You can read more on “Fruit Carrying Ships” and “South African General and Refrigerated Cargo Carrier” on this website. You can read more on cold storage and refrigeration in Wonders of World Engineering.